Killer Chalk Off Prize this week. The opportunity for internet fame. Although we think of truthfulness as a young child's paramount virtue, it turns out that lying is the more advanced skill. A child who is going to lie must recognize the truth, intellectually conceive of an alternate reality, and be able to convincingly sell that new reality to someone else. Chalk Challenge No. 22 is made possible through charitable donation of FREE MELONS courtesy of THE MELON (previously of KUPS Tacoma "The Melon Radio Show") an alternative, independent news internets created by young people interested in the world sprawling around their feet and legs.a MYSTERY PRIZE will also be revealed! by Erik on 9/5/2008 @ 12:39am A number of people had trouble completing this week's puzzle correctly. by KevinFreitas on 9/5/2008 @ 6:45am I'm totally there today. Can't wait to see what Stowe will be bring to the arena. I hear it'll be some more audience participation goodness. See y'all at noon! by joel413 on 9/5/2008 @ 6:57am Yay! The powers that be have allowed me to work from Tacoma today... which means that I am totally in for Frost Park. Choose your slab, get out your chalk and DRAW! DRAW! DRAW! by Elle on 9/5/2008 @ 8:12am I was going to cop out and say I was still fixing my house, but since Joel is going to be there I might have to show up. Besides, someone has to knock RR off of his streak. by NineInchNachos on 9/5/2008 @ 8:54am another non-linear instance of fan art! thanks marumaruyopparai! by Dave_L on 9/5/2008 @ 9:02am Iâ€™ve been able to come up with an errand in Tacoma that I can run at lunch so I can stop by for a few. Neat - Episode 22 puzzle upside-down is still 22. (But I've learned more about the weekly puzzle-process than I should know). by tacomachickadee on 9/5/2008 @ 9:16am The Boy will be very jealous of all'y'all. He was all serious and plotting out his design for today when we had to remind him that he's in kindergarten now. No more chalk-offs until summer -- or if there's a conference or teacher in-service day before chalk season is over. I have lunch plans, but will try to stop by toward the end. RR -- have no fear, I'll get yee your bags o' TAGRO potting soil soon. by jenyum on 9/5/2008 @ 10:20am I think I will be there today, kid-free and with a friend. by NineInchNachos on 9/5/2008 @ 10:45am it's a mighty day for a chalk off, look forward to seeing everybody... and someday hauling the victory tagro. by Erik on 9/5/2008 @ 11:51am Weather is looking pretty good. by Erik on 9/5/2008 @ 2:20pm Wow. A ton of color. A mere 8 hours and 40 minutes left to see who gets their own Melon U Tube video fame and The Golden Melon. by Tacomite on 9/5/2008 @ 2:26pm I'll be the first to throw down a vote. I vote for Ms. Elle. She drew a lovely tribute to the anniversary of taking our son out of an orphanage in Russia. 2 years ago today! Way to go babe. by NineInchNachos on 9/5/2008 @ 2:33pm yes the intensity of color used in Elle's piece really attacks the yummy parts of my brain. It's a great comeback piece. by Elle on 9/5/2008 @ 2:37pm yes the intensity of color used in Elle's piece really attacks the yummy parts of my brain. It's a great comeback piece. Thanks RR. I'll take that as high praise. I am impressed by Ariel's piece this week. It reminds me of the tall ship Andrea did back in July. I also like the innovation Stowe used. I'm always a sucker for a tree and especially one that resembles the tree of life. Well done. All the entries were great this week as always, but I will have no shame in voting for myself this week. Tacomite is correct in saying that 2 years ago today we walked out of an orphanage in Far East Siberia with the boy. It was the proudest and scariest moment of my life. 2 years later I have a few less brain cells, but I wouldn't change it for the world. by tacomachickadee on 9/5/2008 @ 2:42pm Can't resist Tacomite's logic. My vote is for Elle. Elle's technique this week was great, watching it come together from the next square was fun. Stowe, thankyou for the interactive FrostPark Totem, I'm glad to have gotten to be a part of it. Andrea's Tree, Ariel's sunset... everyone wa top notch, I'm glad to have gotten to play along. And remember to DRAW! DRAW! DRAW! by NineInchNachos on 9/5/2008 @ 3:08pm joel your secret city was fun. you commanded that slab! by jenyum on 9/5/2008 @ 3:23pm It was a very colorful week. I really liked Ariels, which was a bit hidden around the corner. This week, however, I think I also have to vote for Elle for the amazing use of color, lovely calligraphy, and the subject matter. by Erik on 9/5/2008 @ 3:37pm Check out Elle's special chalking technology. She literally "painted" the chalk on. by izenmania on 9/5/2008 @ 3:39pm The "Unknown media and reporter" was longtime KING 5 reporter Don Porter. His presence was entirely un-chalk-related... I think they just saw the convergence of people. He was doing man on the street interview stuff to see how much the average Pierce County registered voter knew about ranked choice voting. by KevinFreitas on 9/5/2008 @ 3:52pm Great day out there today! Here are my pics. Vote early and vote often (now and in Nov). by ElectricElliot on 9/5/2008 @ 3:55pm It was great to be a part of another great chalking event. Some impressive pieces as usual and some great innovation from Stowe and Elle. Ariel and Andrea's pieces were gorgeous. RR's was another classic. Little Jossy's piece was fun and had great use of color. The ethic and tact put into Team Red Hot's piece was fantastic, and Joel's attention to detail went unmatched. Saying such, my vote must go to Adam the Alien. How could I not vote for a rendering of me as a superhero? I can't... But more importantly, Adam has brought consistency and strong pieces to Frost Park, I think it's time he was awarded. 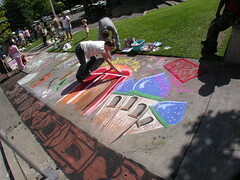 by deeble interactive on 9/5/2008 @ 4:03pm stowe is a chalking machine! he's not natural. I say we start screening for performance enhancing drugs. Well, All but "one" photo is up so far. Over the next week in my free time, I'm going to attempt to construct a "panoramic" image of that totem. If it works, I'll be extremely impressed!! And now for some random and arbitrary examples of todays Works in Progress!! by NineInchNachos on 9/5/2008 @ 4:07pm team red hot is always great. Adam the Alien is a frost park treasure. Andrea is entering into Fine Art's Hudson river school style of romantic landscape renderings. Astonishing folk art comrades. not sure who i'm voting for yet. wow, your batch of photos is the best yet! --I gotta say...despite the impressive totem de Stowe, and the amazing colors by Ariel and Andrea, my heart goes to Russia, with love. Awwwwww. --so here's one for elle! by beerandhotdogs on 9/5/2008 @ 4:25pm Team Red Hot gets my vote, with Andrea a very close second. by jamesstoweart on 9/5/2008 @ 4:29pm stowe is a chalking machine! he's not natural. I say we start screening for performance enhancing drugs. Don't draw with charcoal on bricks. The surface is slick and nasty and breaks shoelaces. by NineInchNachos on 9/5/2008 @ 4:41pm you're a chalk star hero Stowe. Can't wait till my sidewalk sidekick is ready for service (have to wait for him to hold up his own head, walk... take solid foods.. argh! ). by Altered Chords on 9/5/2008 @ 4:48pm Tough decision again today. I love the color I'm seeing in many of the drawings. Regret not being there at 12:00.
by Adam the Alien on 9/5/2008 @ 5:21pm Stowe's art today makes me wonder if we need a mega-post of all the artwork - chalk or otherwise - that has been made depicting the chalkees. From battle art to trading cards to comic covers and actual chalk submissions, there's been quite a number of chalkee-centered artwork from various different sources. I'm rather torn, right now...on the one hand, winning would be awesome. On the other hand, there is SO MUCH ART that I want to vote for! by droid116 on 9/5/2008 @ 5:41pm With the beautiful weather today and the large contingent of spectators there was a fair like atmosphere at Frost Park today. The number of people taking pictures and the stop off of the KOMO folks (though not chalk related) added to the festivities. Great work by all, but I am going to give me vote to Elle. by Wings_of_Change on 9/5/2008 @ 5:44pm I think I will be voting for Andrea this week. her colors just blew me away, plus the detail on that tree was astounding. by NineInchNachos on 9/5/2008 @ 5:50pm pedestrians walking to destinations were ARRESTED by Andrea's art and stage presence. That's got to count for something. by NineInchNachos on 9/5/2008 @ 5:51pm Andrew Fry gets an honorable mention for his street-smart knowledge of Ranked Choice Voting. nice work Professor! by Adam the Alien on 9/5/2008 @ 5:55pm Despite the sheer talent displayed by all, and my personal desire to lean toward certain ones (most notably Stowe's, as he yet again experiments beyond the usual bounds AND incorporates the community), my vote has to go to Elle. Not only is the piece stunningly gorgeous, but what tips her ahead of the rest is the personal nature of it. I read her blog this morning before I came out to chalk, and it may be one of the most beautiful things I've ever read. At the park, she translated that same feeling to chalk form. It's too hard to look at that piece, both at the park and in photos, and not feel it. by AngelaJossy on 9/5/2008 @ 5:55pm Great job everybody! Andrea, your tree took my breath away and it wasn't even finished when I had to wisk my little Jossy back to SOTA. Stowe- I want a transcript of the contents of that Tacoma totem. Did I see myself in there? Did someone finally grant my secret (not-so-secret) wish? Elle, you tug my heart strings with the back story and that beautifully painted-on chalk drawing, but as a mother I think you'll understand that I must vote Little Jossy. I love that she designed, drew and colored all by herself and had some wonderful details - especially the rainbow skin color - which is very progressive IMHO. By the way, are any of you taking me up on my offer and coming to chalk some signs for Point Defiance Music Festival? We've got pavement plus some really big chalk boards from a closed down elementary school that we're going to use as the stage schedules at each of the 4 stages. Little Jossy and I will tackle it if none of you are available tonight or tomorrow morning but I thought someone might see the promotional value of chalking it up Frost Park style. (also see my blog for my compensation offer). by droid116 on 9/5/2008 @ 6:13pm Thanks for the honorable mention on the streets smarts RR. But my description of what Ranked Choice Voting is was CLOSE, but not entirely correct. Joe on the other hand gave a schooling on Rank'n those choices and voting for your candidate. They should use his words as part of the voters pamphlet. by Dave_L on 9/5/2008 @ 6:31pm It was a good day in the park. 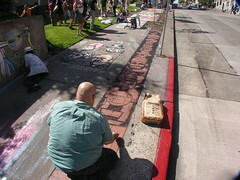 Even one father and son from the â€œupperâ€ park came down to chalk. It was feeling like another one of these weeks where I think voting should be abolished because itâ€™s so damn difficult to choose. I like how Andrea's branches out (oops, that was unintentional) in a new direction, though I hate to single one out because I like several of the works VERY much, for the same reasons stated by others in previous comments above. But for the same reasons stated by others in previous comments above, without a doubt, I cast my VOTE for ELLEâ€™s art and family story. 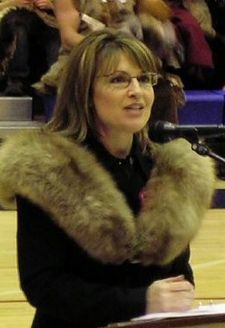 I simply canâ€™t-NOT vote for her this week. by Erik on 9/5/2008 @ 7:11pm Andrea's piece with the tree and sinking ship is beautiful and RR outperforms on the Traveler. Ariel and Adam may have created their best pieces yet. These and other deserve to win. 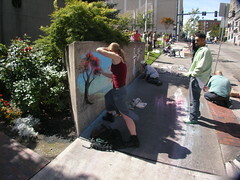 Elle poured a ton of color on this week though and brought some new technology to Frost Park. Its hard to decide. However, the nature of prize will be the tie breaker for me. Elle runs the "Life of Elle" like a mix between the Oprah show and an Ultimate Fighting bloodsport. If she prevails, I think the Melon "no holds barred" interview with her should be pretty good considering how well her film on Episode III turned out. I think Elle can deliver. Thus, I vote for Elle. by KevinFreitas on 9/5/2008 @ 7:16pm Stowe's epic totem was mighty impressive to watch come together. Big props to Andrea for her serene departure from other of her chalk pieces. Ariel likewise wowed me with her stunning sunset Narrows vista. RR's piece was a pointed as ever and Joel and Elle both impressed. In the end, I have to vote team Red Hot just because it's lovely. And as they struggled to finish by filling in the word on the banner chose "Anything" which, for some reason, just sings to me. by morgan on 9/5/2008 @ 7:26pm Wow! Wow! Wow! What a showing today! Such innovation and effort! I am way impressed with the scale and quality of Stowe's piece. He gets my vote. by NineInchNachos on 9/5/2008 @ 8:21pm somebody wake up the TacomaGnome... the little devil needs to vote! by tacomachickadee on 9/5/2008 @ 8:40pm Little Chickadee votes for Ariel. The Boy votes for Adam The Alien. by TacomaGnome on 9/5/2008 @ 8:51pm Certainly as a humble servant of her garden, and having watched her in action this week as she juggled family, horrific home repairs, and her marvelous cooking skills, it is only proper that Elle be rewarded. by NineInchNachos on 9/5/2008 @ 8:57pm I draw better than anyone who can draw faster, and I draw faster than anyone who can draw better! atleast that's what the younger, crueler RR would say before voting for himself. Having a child has softened my icy heart. I now can empathize with other human beings. Adam the alien is a true believer in this chalk event. he is tenacious and it is a joy to see his skills and chalk persona character develop (space opera like). I vote for Adam the Alien! by Dianne on 9/5/2008 @ 9:06pm I vote for Ariel. by jacksonscott on 9/5/2008 @ 9:11pm I vote for Team Redhot. Am I too late? by judges19merescued on 9/5/2008 @ 9:33pm Can't decide. Can't vote. Just much love to all who chalked (and their support teams.)!! I so enjoy and appreciate what you ALL do-- Quite the diverse mix of awesomeness! there is still time to rally your friends! by joel413 on 9/5/2008 @ 9:58pm Someday we will all get around in our HOVER KALAKALA!!! by anubismp on 9/5/2008 @ 10:12pm I vote for Stowes totem. by tacomachickadee on 9/5/2008 @ 10:23pm And you still have until midnight (though it's still Elle, Tacomite and the cutie pie's Gotcha Day until midnight ... I'm not lobbying or anything ... no ... I'd never do such a thing ... never never never). by ALT on 9/5/2008 @ 10:30pm Geez, this is tough; I'm divided between Ariel's bridge, Adam the Alien's DBZ/Street Fighter style fight scene, and Stowe's innovative totem pole. Both Ariel and Stowe made great use of their respective canvases, using them to help influence the appearance of their entries. Ariel's sunset and bridge exhibit a dazzling use of color, light, and shade, and I love the way Stowe incorporated us chalkies (myself included :) into his totem pole. After a little extra deliberation I've decided to vote for Adam The Alien's "Fight Club". The Alien has stylistically come a long way, and I love his current edgy look and suave, bright white attire. Plus the whole scene plays on my affinity for Dragon Ball Z, Street Fighter, and Mortal Kombat. by Courtney on 9/5/2008 @ 10:46pm I love Electric Elliot's chalk banner. Very Tron-ish. Elle, your piece was lovely and the story behind it amazing. RR nice work on the Traveller again (and the little one is so cute). There were so many pretty ones too, Andrea's , Ariel's, and the Red Hot teams. I agree that Adam has improved with every chalk off and needs some WIN love. However, I have to be loyal and vote for my hubby Stowe and his ambitious cool totem pole. By the way I suggested totem pole :). by izenmania on 9/5/2008 @ 10:49pm I've seen a number of people asking about the contents of Stowe's totem. If you look at it in the full context, you will see that each segment of the totem corresponds to the artist and the art in the panel next to it. His piece was determined by the art around him. For example, next to RR is RR, with the four heads of the Traveller above him. The one that looks the most like Angela, that she may have mistaken for herself, is actually Megan of the Red Hot, who was drawing right next to it. Above her is her co-artist, topped by a rendition of their piece. Other segments of the totem include Joel, topped by T-Dome on a floating island, Elle topped by her Russian architecture, Adam with a fireball shooting alien, and Andrea with a tree growing from her head. It took me a while to notice it... didn't figure it out until I saw that his bit next to the younger Jossy matched her character's vertically oriented eyeballs. Quite impressive, really, since he was unable to plan, or get a head start on anything except for his own head at the top. Kudos to you, sir. by izenmania on 9/5/2008 @ 10:53pm Err... all that said, my vote is for Adam. He has been stepping it up week after week, as well as consistently meta-arting... most of his pieces are either about chalkies, or playing off of not-quite cleaned pieces, etc. by AngelaJossy on 9/5/2008 @ 11:06pm Damn. I knew it was too good to be true. by JessicaJossy on 9/5/2008 @ 11:41pm this weeks was really good i almost can't decide. but i vote for elle i was simply amazed. by izenmania on 9/6/2008 @ 12:06am Damn. I knew it was too good to be true. Well, it may not have been you, but at least one Jossy made it on the totem, eh? 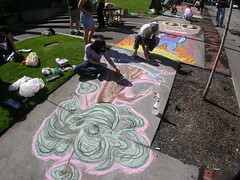 Elle Wins Frost Park Chalk Off Episode XXII. I am looking forward to the Melon exclusive interview with Elle. Although she has won a number of times, Elle has never attended a Chalkie prize transfer ceremony. The first prize she won was before they were really set up. In Episode XIII, Elle prevailed but there was no prize offered. In today's episode, she had perhaps her strongest showing relative to the other contestants that cannot be attributed to her followers. Looking for something to read which shows that other people are going through worse times than you? by ElectricElliot on 9/6/2008 @ 12:38am Congrats Elle! An email is coming your way. by Elle on 9/6/2008 @ 8:04am yes, my life is a little hectic and frazzled these days. Thanks for the votes everyone. I can say that I didn't pad any votes this week. 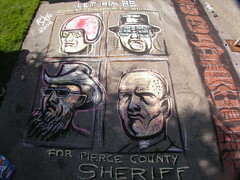 I didn't post on my site that I had participated and spent the entire evening with friends who didn't even know what Frost Park was or who didn't understand why anyone would want to participate in a chalk drawing contest. by Erik on 9/6/2008 @ 12:42pm A couple special mentions at Frost Park yesterday. Fortunately, Frost Park's own professor Frye was there to answer his questions on ranked choice voting. Watermelon is a wonderful, wonderful fruit. It is a food group unto itself. by ElectricElliot on 9/6/2008 @ 6:07pm Good to hear, shoot me an email with your address and I can deliver it to you. by ALT on 9/6/2008 @ 10:13pm Congrats Elle! And hey - way to go Adam! by Dave_L on 9/7/2008 @ 12:25pm As always, the comments are great, and point out details I totally missed (being an unobservant guy), like the fur boa and the most excellent, Jetsony, hover-Kalakala. So ongoing thanks to all who take the time each week to photograph and post their photos. by Erik on 9/7/2008 @ 8:36pm I just received this from Elle. The awesome prize transfer photos. Tacoma awaits the interview of Elle by Electric Elliot. Two very different worlds are about to collide. by NineInchNachos on 9/8/2008 @ 8:59am amusing conclusion of FPCC22 ! Thanks for your hard work Elle, and thanks to Electric Elliot and Chris 'the wedge' Van Vechten of the Melon for this amazing opportunity. we look forward to the new The Melon news website! !